Cross Academy is attended by two groups of students: the Day Class and the Night Class. At sunset, when the students of the Day Class return to their dorm, they cross paths with the Night Class on their way to school. Yuki Cross and Zero Kiryu are the Guardians of the school, there to protect the Day Class from the Academy’s dark secret: the Night Class is full of vampires. Thoughts to ponder on: Why is the act of feeding a vampire real blood consider forbidden? 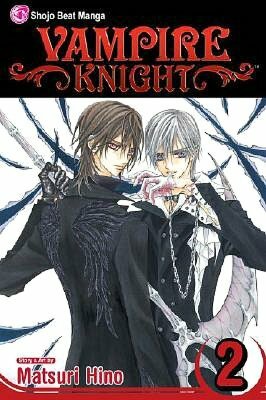 In the second volume of Vampire Knight, things start to unraveled and the world Hino is building shows more complexities than before. We learn of a vampire hierachy that consists of five levels. Purebloods like Kaname at the the top, aristorcrats are second, third are common vampires, fourth are humans that have been turned into vampires and the most dreaded of all levels, Level E for end (extinction). Level E are that vampires that were once humans but have lost their sanity so they go on killing sprees. I think the hierachy is interesting because the vampires of the Night Class have a disdain for the human-turned-vampires being which makes me wonder where do vampires come from? And what is a true Pureblood? Since the manga implies that Purebloods are in short supply. Of course, there is always tension between vampires and vampire hunters, especially when one comes into the school. Yagari Toga is a vampire hunter and the former master/teacher of Zero before Zero’s family was murdered. Remember, Zero is now a vampire, a reluctant one, but still a vampire. What Zero is causes a lot of tension for Yuki because Zero is rejecting the blood tablets that are supposed to keep his blood lust at bay. She ends up committing the “forbidden act” of giving Zero her blood. Now, Yuki is trying to protect Zero from going insane and at the same time, keep it a secret from Kaname. Yeah, there wasn’t anything groundbreaking in the manga. The Vice President Ichijo had a birthday party and Zero and Yuki where invited. Only after they were attacked by a Level E vampire in the city. That was interesting because once again, Yuki was incapable of defending herself against a rogue vampire. She does not appear to be a fighter at all. My favorite scene is actually the short little bonus story after the novel has ended. In this scene, Kain calls Kaname a “gang leader” and Aido replies with call Kaname a “supreme gang leader.” Kaneme overhears this and decides to place a water-filled bucket on top of Aido’s head (and I find it hilarious). Supreme gang leader, that’s right. I’m a huge fan of vampires so I was easily captivated by this manga. I love the artwork, especially the buildings. They have so much details. The uniforms are easy on the eyes but I really like the artwork that accompanies the chapter divisions. Really pretty. That being said, the story line does raises a couple of questions for me. Such as why do vampires attend school where they are not biting anyone? That’s the only reason I could think of for vampires to be attending school. Unless they are really there to learn but learn what exactly. The manga is surrounded by cliches but the book is entertaining. The basics consists of what the blurb mentioned. Day Class and Night Class attend the Academy. But more importantly, the vampires are all drop dead gorgeous looking. The Guardians are Yuki Cross (daughter of Headmaster Cross) and Zero (stepbrother to Yuki). They are supposed to keep the Day Class safe from the Night Class but their skills should be in question. Yuki, who is trained to do her job, has a hard time actually doing her job. She let Aido, a vampire, licked her bloody hand when she knows that vampires are not allowed to drink blood on campus. And of course, we have the lovely love triangle between Kaname, Yuki, and Zero. I’m a supporter of Yuki and Kaname, not Zero. Kaname is apparently the supreme leader of the vampires in the academy and Zero is a descendant from a vampire slaying family. To add a cliche and a spoiler (I’m sorry), Zero is slowly becoming a vampire, the one thing he detests with a passion (and he does have a reason). And both, Zero and Kaname, are in love with Yuki but won’t admit it to her. Plus, Yuki is a little naive when it comes to both of them. I am giving this manga 4.5 butterflies because I like vampires and the book is entertaining (even if its full of cliches). The artwork is decent on the people but better on aesthetics. The main point of this volume is to introduce the characters and reveal the love triangle. I had laugh-out moments when I was reading such as when Headmaster Cross comes into the picture and Aido. They are both hilarious and steal the scenes they are in.